The heat is on in Saigon as Miss Saigon: The 25th Anniversary Performance will make its world premiere in U.S. cinemas on September 22, presented by Fathom Events, Universal Pictures and PictureHouse Entertainment. The spectacular performance of the global sensation is produced by Cameron Mackintosh and features a special finale in which the 25th anniversary cast is joined on stage by original cast members Jonathan Pryce, Lea Salonga and Simon Bowman. Tickets for Miss Saigon: 25th Anniversary Performance can be purchased online by visiting www.FathomEvents.com or at participating theater box offices. Fans throughout the U.S. will be able to enjoy the event in more than 175 select movie theaters. For a complete list of theater locations visit the Fathom Events website (theaters and participants are subject to change). "Remarkably, the emotional performances of this wonderful cast in close-up seems entirely natural as if they were being shot for the cinema rather than being performed in a 1,700-seat theatre," said Mackintosh, in a statement. "The clarity of the sound and the sweeping music makes this passionate story even more intensely thrilling and moving on the screen." Based on Puccini’s Madame Butterfly and set in 1975 during the final days of the American occupation of Saigon, the Boublil and Schönberg musical follows the relationship between an American GI and a young Vietnamese woman. Orphaned by war, 17-year-old Kim is forced to work as a bar girl in a sleazy Saigon nightclub run by "The Engineer." John, an American GI, buys his friend Chris the services of Kim for the night, igniting a doomed trans-Pacific relationship. 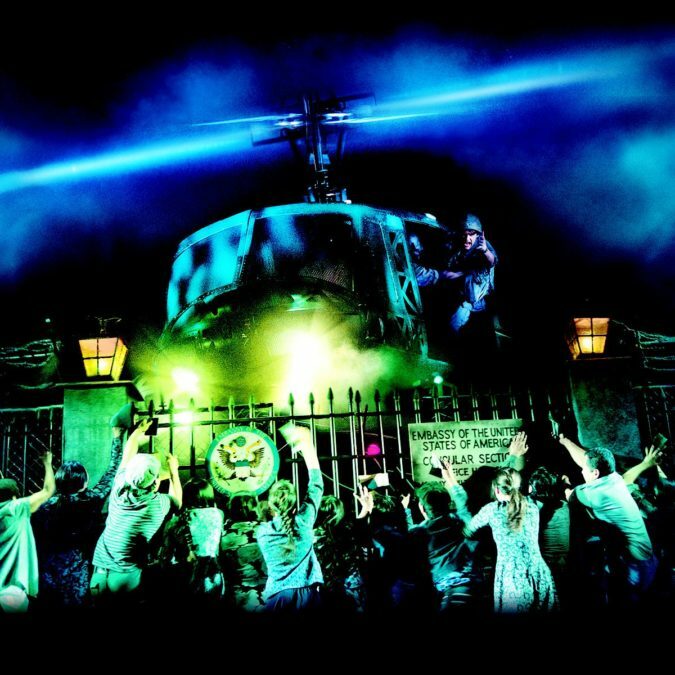 As previously reported, Miss Saigon will helicopter in to the Broadway Theatre, where the show made its New York premiere in 1991. The limited engagement will begin on March 1, 2017 and will play through January 14, 2018 before touring the U.S. Opening night is set for March 23.